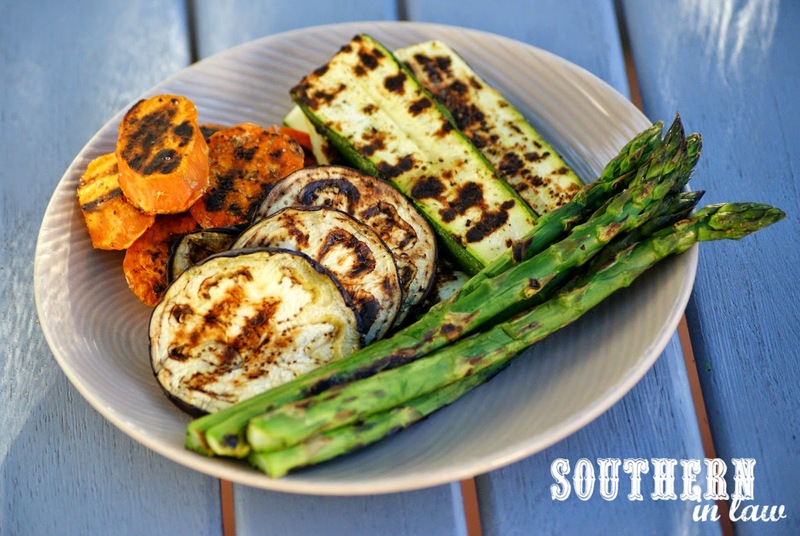 Southern In Law: Recipe: Our Favourite Seasoned Grilled Vegetables PLUS Healthy Grilling Tips! Recipe: Our Favourite Seasoned Grilled Vegetables PLUS Healthy Grilling Tips! When the weather starts getting warmer, we head outside. Jesse and I love eating outside - and we also love cooking outside too! Spring and Summer is when we tend to have the most barbeques with our friends and family (or even just for the two of us). I often hear my friends and family say that barbecues are an unhealthy affair - but they don't have to be! Grilling is actually one of the healthiest ways of cooking and there are so many delicious meals you can cook on the barbeque - you don't have to be stuck with boring old fatty sausages, mayo loaded potato salad and greasy hamburger patties. 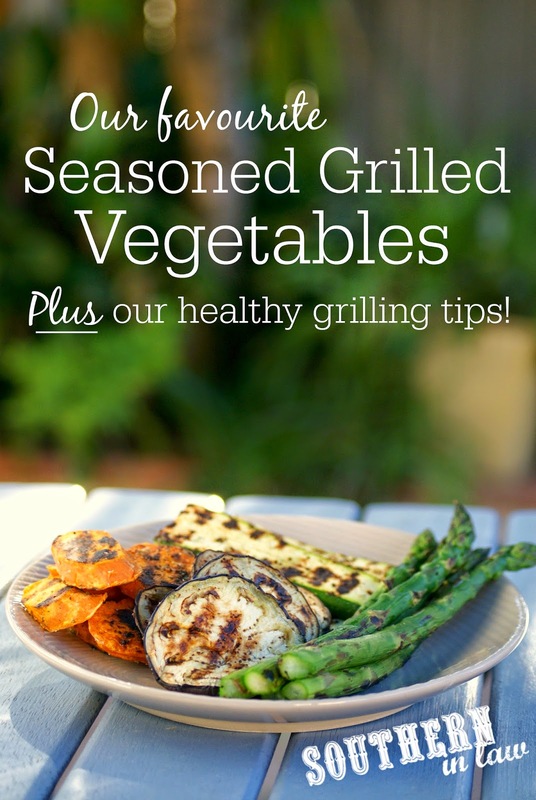 When our friends at Barbeques Galore came to us looking for some healthy barbeque inspiration, we thought it would be the perfect time to share our favourite grilled vegetable recipe - and to also share some of our healthy grilling tips! We all know that the world associates Australia with "throw a shrimp on the barbie" - and even though we don't actually call them shrimp (they're prawns! ), Australians do love a good barbeque! They're the perfect way to get friends and family together to enjoy a good meal and a good laugh - and they're one of our favourite ways to entertain. Throw on some seasonal veggies or fruits! We loveee grilling fruit and veggies - and they're the perfect side for any barbeque. Eggplant, zucchini, corn, asparagus, potato, sweet potato, pumpkin, mangoes, banana - even watermelon! Take what you have in your fridge or pantry and get experimenting! We love playing around with different seasonings and using our grilled fruits and veggies in different dishes - but be sure to check out our favourite seasoned grilled vegetable recipe below because that's our go-to! You can grill more than just steaks and sausages - try seasoned or marinated chicken or turkey breasts, lean beef patties, turkey burgers, chicken burgers (get inspired: thai style chicken burgers with chicken breast mince, chilli, garlic, coriander and fish sauce) or even get a little bit more adventurous with meats like kangaroo, bison, deer or crocodile. Don't forget fish and seafood are also great on the barbeque - try prawns, salmon, or even a whole snapper with lemon and pepper! It's not just what goes on your grill that you need to think about - sides are important too! We love recreating old favourite recipes in a new, healthier way. Try our Healthy Potato Salad Recipe (with no mayo!) or our Watermelon and Feta Couscous Salad (perfect with grilled watermelon - it takes the flavour to a whole new level!) or a Noodle Salad. You don't have to be limited to the grill plate! Sure, you're cooking on a barbeque, but you don't have to be limited to the grill plate - we'll often cook in a heat-safe wok or frying pan on top of our barbeque (just make sure you have an oven mitt or silicone glove so you don't burn yourself!) for cooking sides or marinated meats. It saves energy (as you're using the grill that's already hot for your other food) and saves time as you can do both things at once! We love experimenting with different recipes on the grill. We're currently perfecting a grilled pizza recipes - and the possibilities are endless when it comes to your barbeque! We've grilled fruit and veggies, meatballs, oysters, quesadillas, avocadoes, bread - the list goes on and on! We find that even fussy eaters love grilled vegetables as they have so much flavour - so you may even find you like something you've never liked before! a simple seasoning mix that's perfect for veggies or meats! A selection of veggies that you have, washed and sliced into about 1/4 inch slices or left whole (for small vegetables) - we usually use any of the following; asparagus, beetroot, eggplant, zucchini, sweet potato, mushrooms, onion, capsicum/bell peppers, whole corn cobs etc. Mix together your seasoning mix and add it to a freezer bag/zip lock bag with your veggies and a sprinkle of water. Gently shake around your vegetables to coat them with the seasoning mix and place them onto your grill. When grilling, lightly brush the grill plate with a little bit of oil or butter to stop the vegetables sticking or using a non-stick grill pan or grill sheet (though you won't have the lines on a grill sheet). Cook your veggies until they're cooked through - between 3-5 minutes a side depending on the vegetable and thickness. But tell me, are you a barbeque fan? What's your favourite thing to grill and what's one dish you always bring along to a barbeque? 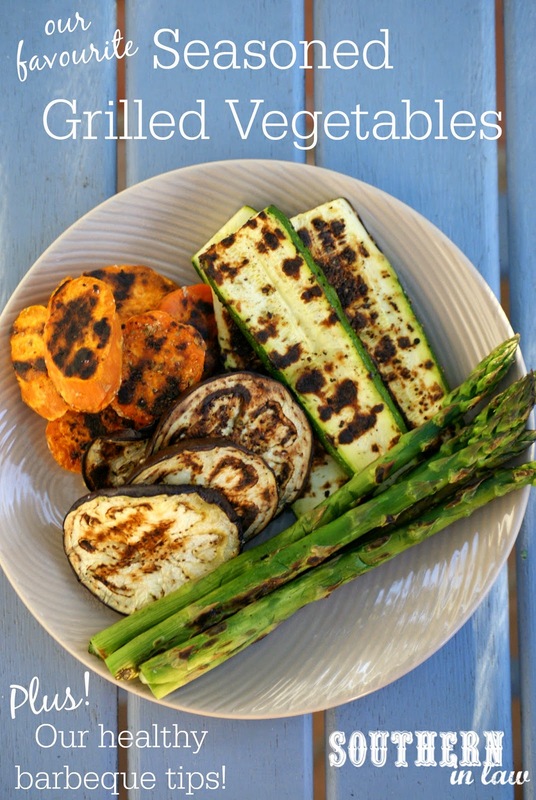 I'm usually the dessert girl when we head out to a friends house for a barbeque, however, I love bringing along grilled veggies for something different! This was a sponsored post for Barbeques Galore. All opinions expressed in this post and the recipe are completely our own and have not been influenced by the company in any way. If you're interested in working with Southern In-Law on a sponsored post, please contact us at southerninlaw@gmail.com for more information. HUGE grilling and BBQ fan right here. I'm a Southern girl through and through--grilling and BBQ is another part of life where I live. Ha! One of my favorites meats to grill is venison burgers. So delicious. By far my favorite meat to have in burger form. Other than that, I am becoming a huge fan of grilled carrots and zucchini! I can't believe I went through a weird phase a few years ago where I was so against grilling (I was scared of the carcinogens). But now, no way! I am all for grilling all.the.things! Mmm, grilled carrots and zucchini are so, so good! I've never tried venison but Jesse has - he's pretty much tried every meat you possibly can try, haha. Grilled mango is so SO good. Grilling is seriously the best way of cooking! I didn't know you could grill watermelon! I actually stumbled across it by accident - I was making a watermelon and feta quinoa salad and added in the watermelon, forgetting I'd still had the heat on and the watermelon started to cook - and it was so good! Then I found all of these recipes for grilled watermelon! It sounds odd, but it's delicious!